Dr. Singh is an internationally known strategy expert in e-Commerce, Trade and Migration and has done several studies for international agencies, including the World Bank, International Trade Centre, International Labour Organisation, World Health Organization and South Centre, Geneva as well as the Commonwealth Secretariat, London. He is an author and former IAS who has worked with the government, corporate sector, private sector, and has an academic background. He is presently Principal Adviser to President FICCI. He also functions as Chair of the Diaspora group of KNOMAD (Knowledge Network on Migration), of the World Bank and has recently been appointed as Member of the ILO Global Commission on the Future of Work. He has given talks and lectures in over 50 Institutions and 20 countries around the world and has four books and several publications to his credit. Dr. Singh served as a member of the Global Agenda Council on Migration of the celebrated World Economic Forum (WEF). He also served as a Member on the India-Indonesia Eminent Persons Group (EPG) nominated by the Ministry of External Affairs. 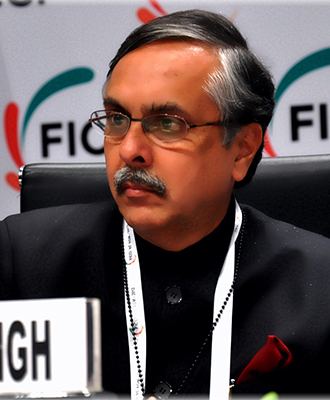 He has served as a member on several international councils such as the International Working Group on Financing Pandemics Preparedness (IWG), Advisory Group of the Comptroller and Auditor General of India and Governing Councils of St. Stephens Hospital and Guru Gobind Singh Indraprastha University, Delhi. Dr Singh retired as Union Secretary in the Ministry of Overseas Indian Affairs. He was MD/CEO at ESPL, Punjab Electronics, Meghalaya Tourism, Meghalaya Cements and was a Director on the Boards of Invest India, NTPC, BHEL, HMT and Chairman of Indian Council for Overseas Employment & Overseas Indian Facilitation Centre.